If you’re lucky, summertime means fresh tomatoes from the garden! If you don’t have a garden/green thumb, maybe you have family or neighbors who do. Your local Farmers Market is probably bursting at the seams with tomatoes, too. I’m a little finicky and don’t really like biting into a tomato like and apple… I like to peel and remove the inside seeds/gook first. But after that… oh the possibilities! Chunks of fresh tomato are great for sauces, soups, and pico de gallo. But the snack that truely turned me into a fresh-tomato fan: Bruschetta! 4. You make it in advance, and just pull it out of the fridge when needed. Grab-And-Go! Each time I’ve made this, I’ve used a different type of basil. Mainly because it was the basil my family had growing at that particular moment. Sweet Italian is the basil most people think of when cooking (thanks to Food TV). But I’ve had just as much success with Sweet Aussie Basil (developed in Austin, TX) and Cinnamon Basil (don’t let the name deter you; it works great!). 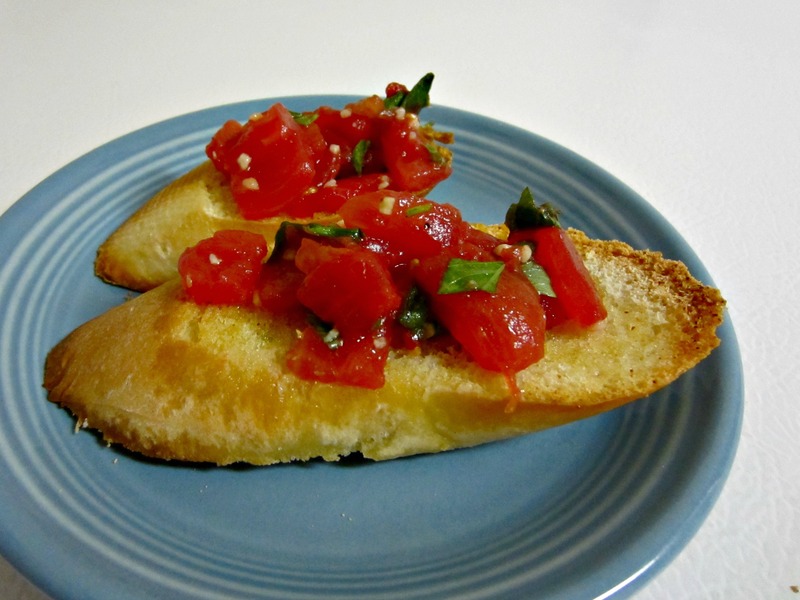 There are no hard and fast rules for bruschetta, but here’s the recipe I’ve has the greatest success with. It tastes good on little toasts (recipe at the end of this post). But if you don’t have a baguette handy, it’s delicious on Triscut Crackers or grilled chicken! Combine above ingredients in a resealable container. Store in fridge until ready to serve. Cut the bread at an angle into slices about ½-inch-thick. You don't have to be exact, just make sure the slices are roughly the same size. Brush both sides of the bread with olive oil. Bake for about 10 minutes, until lightly toasted. If not eating right away, put the mixture in the refrigerator.